This is the 2nd book in the Thoughtless series and I started it immediately after reading the first book and finished it in one day, yeah I loved it so much I didn't want to put it down. I absolutely fell in love with the characters in the first book and reading the second was bittersweet because I didn't want it to end. This book focuses on life with Kiera and Kellan after the ordeal that was the beginning of their relationship, and the trust issues that they have to learn to work through. I love that the author addressed these issues, because if they'd had their 'happily ever after' immediately after the first book it really wouldn't have been realistic. When Kellan has to go on the road for the next six months, Kiera has to stay behind to finish her schooling. Both of them have to learn to trust each other, knowing that Kiera's separation from Denny played a big role in them getting together in the first place. I really enjoyed seeing how much Kiera & Kellan grew in this book. Kiera seems to gain a degree of confidence and independence that she didn't have before. Kellan is so sweet and does so many nice things for her that it makes their separation somewhat better. I loved that about him. We also get to see more of the side characters in this book, and the lives of the other band members also become a bigger part of the story, especially Griffin. Griffin is the main comic relief and I'm always waiting to see what he's gonna say or do next. Overall, it is a really good book. 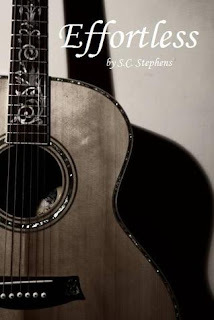 The story is wonderful, and for those of us who want more word is that S.C. Stephens is currently working on the third book now, yay! I loved this book. It was a great sequel to Thoughtless.